Spotify Premium allows users to enjoy many features (offline playing, high-quality sound). 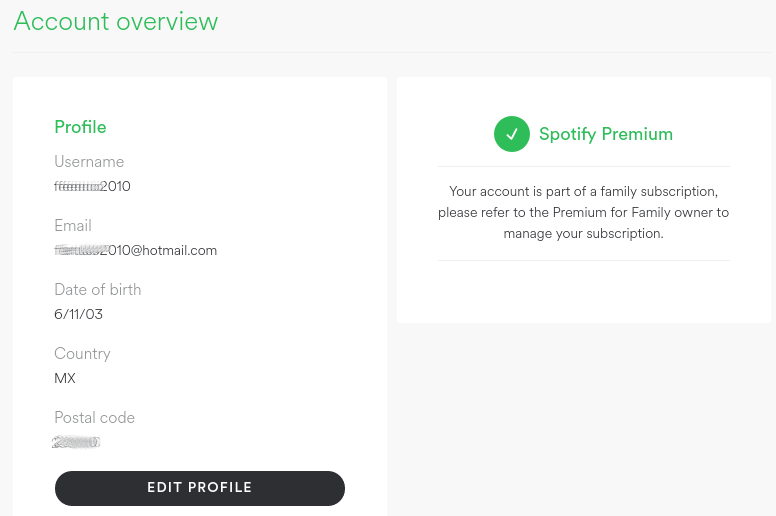 Since quite a time, Spotify offers Family Premium that allows you to have up to 6 members for a fixed rate. I will share with you all a tip I figure out to save more money and keep Spotify Familly Premium working. Have a verified Paypal account, Debit Card or Credit Card from a country of a soft currency. I define a soft currency as the one who has depreciation and variation. In my specific case Mexican Peso. Live in a country with a hard currency. I define a hard currency as the one who has low depreciation and almost no variation. American Dolar, Canadian Dolar, Euro, Pound are good examples. So you should be living in one of the countries with those currencies. Your Spotify account must be set to the same country of your Paypal account, Debit Card or Credit Card you are going to pay. You can use the Hola VPN plugin from Chrome store to do this. Change your country profile setting to the same of your sponsor. Now, let's do some maths to back up this. Spotify Family Premium cost is 149 MXN in Mexico, its cost in Canada is 14.99 CADs. Converting all to my local currency (CAD), 149 MXN = 10.41 USD (using current rate 1 CAD = 14.31038 MXN). So, from the very start, you are saving 4.58 CADs. The good thing about Family that some members can be non-family members, Spotify verification runs on checking all accounts belong to the same country. In my specific case, my friend Jessica is joining me in this (and hopefully her boyfriend will join us). She is helping me out with 40 MXN (2.80 CAD) for her account. This means me, as the tenant of the family membership, it really costs me 109 MXN (or 7.62 CADs).